Congresswoman Wilson giving food from Feeding South Florida who brought its Mobile Food Pantry to distribute food to needy families. Congresswoman Frederica S. Wilson recently held a town hall meeting to discuss the impact of the Nov, 1, 2013 cuts to the Supplement Nutritional Assistance Program (SNAP) will have on South Floridians who depend on the program to feed their families. 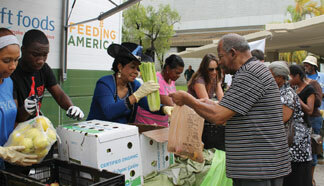 Pictured is Congresswoman Wilson giving food from Feeding South Florida who brought its Mobile Food Pantry to distribute food to needy families. A bout 700 people attended the town hall meeting and food distribution event.